Sinus pain and pressure can be unbearable at times, which is why it’s good to be aware of the various sinus pressure points that can help relieve sinus pain. This recurring and frustrating source of pain often becomes more noticeable during allergy season. The pressure is frequently a result of blocked nasal passages, which can lead to inflammation in the face and head. Aside from seasonal allergies, sinus pressure is also a potential symptom of the common cold. 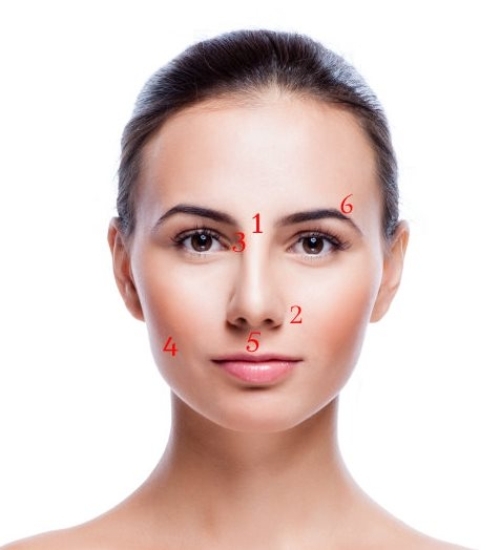 The first pressure point is located between the eyes and above the bridge of the nose. With a finger, press on this point for two minutes. It will help drain mucus, and will alleviate pressure from a cold. This is a sinus drainage pressure point. Use your fingers to apply gentle pressure to both sides of your nostrils. Your fingers should be at right angles to these points. Keep pressing for a minute to allow the sinuses to drain out; this can help prevent inflammation and bring some sinus pressure relief. This pressure point is also good for pain behind the cheeks and helps prevent respiratory illnesses. Find the spot just under the corners of your eyes and at the start of your nose. Using your two index fingers, apply pressure in and then up, for up to five minutes. This is where the pain associated with the sinuses is usually found, and you will feel some relief from the pressure behind your eyes. A sinus massage here is ideal as well. Place your fingers and gently rub in a circular motion for a few minutes. Located almost directly beneath the pupil, this point can be found by placing your finger on your cheekbones and feeling for the bone. The point will likely be quite tender when pressing in and upwards against the cheek, and often leads to a release of pressure from the sinuses as well as the Eustachian tubes. It’s a good point to massage if there is pain or pressure in the maxillary sinuses or around the cheeks, or inside the mouth if you’re suffering from a toothache. This sinus reflexology point is located directly under the nose, where the groove in the middle of your lip is, to be precise. Press in and then up to get this pressure point stimulated for maximum effect. This will allow the sinuses to drain extra mucus. Treat this pressure point by locating the ridge of your eyebrows, and then tracing it with your thumb. Apply pressure, starting from the inner ridge and then moving outwards to each side. Do this same motion for about two minutes. After this time, you will feel relief from the pain and pressure. You may be able to relieve sinus pressure by pressing on the ear gate, which is found on top of the ear, just in front of the lobe. Use your thumb and index finger to press and hold the point for about five minutes. Another pressure point sits at the bottom of the ear, behind the ear lobe. This is called the windscreen. Hold for three to five minutes on both sides of the ear. It may offer you relief from both sinus pain and ear pain. There are areas around the neck and base of the skull that present an opportunity to relieve sinus pressure. The pressure points in these areas are located in delicate, cavity-like areas where the neck and skull adjoin. There are two such points. One of them is the specific point where the neck meets the skull. It is right in the middle of the neck/head, near the base of your hairline. To find it, place your finger at your hairline and move it either up or down until you find the cavity. By squeezing the point with your thumb for about five minutes, it may help clear sinus pressure. The other area is found on the neck close to the base of the skull. The points are located at the highest point of the neck, just below the base of the skull. To find it, place both of your thumbs at the top of your neck point and slowly separate them until you feel the cavities (they should be about three inches apart). Access the point by pressing slightly in and up and holding for about five minutes. The soft tissue between your thumb and index finger may serve as a pressure point for sinus relief. If you can’t find the area by touching it, place your hand flat on a table and bring your index finger and thumb together. The point is beneath where the skin rises up highest. Your fingertips may also be able to act as pressure points for sinus relief. To activate any of these points, simply press and momentarily squeeze each the end of each finger. There are also pressure points along your hands right next to your fingernails. These points are just beside the nail, in the corners where the base joins the skin. There are also pressure points on the feet that may improve sinus pressure. Much like your fingernails, the toenails also have pressure points. The areas, you’ll find, are almost identical to your fingernails with a few minor differences. Toenail pressure points are located at the base of the nail where it meets the skin. Press each of these points lightly, and you may notice some sinus pressure relief. Also, like your fingers, your toe tips have pressure points that may be useful in clearing sinus pressure. Use the same method as you would for fingertips. Massaging the balls of your feet may also offer an answer to relieving sinus pressure. You can do it yourself, but it’s probably better to get someone else to do it. Who couldn’t use a foot massage? As you’ve seen, there are pressure points you can access from head to toe that may help relieve sinus pressure. Go through and test them all to see which might work for you. Below are some other options to show you how to relieve sinus pain without doing facial reflexology. Use a humidifier: Moist air keeps the sinuses lubricated so they don’t become irritated. Use a saline spray: Saline nasal sprays are good for lubricating the lining of the nasal passage. A hot shower will also help to get moisture into the sinuses. Keep hydrated: Staying hydrated is important, especially by drinking hot beverages. Ginger tea with lemon has anti-inflammatory properties and will help boost your immune system, and it also provides your body with vitamins and nutrients to help fight off the infection causing pressure and pain. Warm compresses: Placing a warm compress (which can be done at home with a face cloth and warm water) on your face while lying down will help reduce sinus pressure. Elevate your head at night: Propping yourself up with a few pillows will allow the mucus to drain better. Eucalyptus: Eucalyptus is an anti-inflammatory herb, so drinking tea or inhaling steam with eucalyptus oil in it can clear out the nasal passages. It might be difficult to prevent a sinus infection itself, because it’s a side effect of being sick from a cold or the flu, but below are some tips that could possibly reduce the intensity or duration. Use a neti pot to keep your nasal passages cleansed. Keep nasal secretions thinned out by drinking lots of water. Avoid air travel if possible. Not only is the air incredibly dry, but it’s full of recirculating germs. If you suffer from allergies, then avoid the places where they live, whether it’s around pets or outdoors in spring when pollen is at its highest. Practice good hand washing habits, to help prevent the transmission of colds and flu in the first place. By learning how and where to apply pressure, you may be able to improve circulation, open up airways, and push fluids out of the sinus area.